Manufacturers Index - Bullard Machine Tool Co. 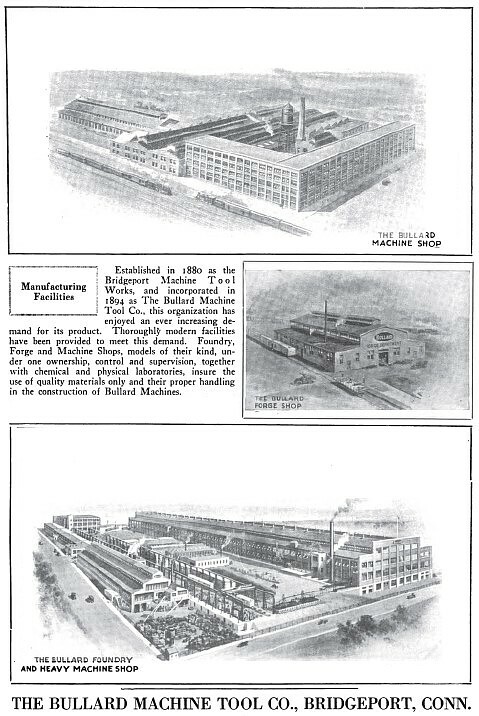 The Bullard Machine Tool Co. was formed as a reorganization of the Bridgeport Machine Tool Works by Edward P. Bullard Sr. in 1894. The Bullard Machine Tool Company is almost a city in itself with its 1,200 employees, ninety per cent of whom are skilled workmen, contributing to the success of this mammoth enterprise, which is most wisely and carefully directed by men of long experience. 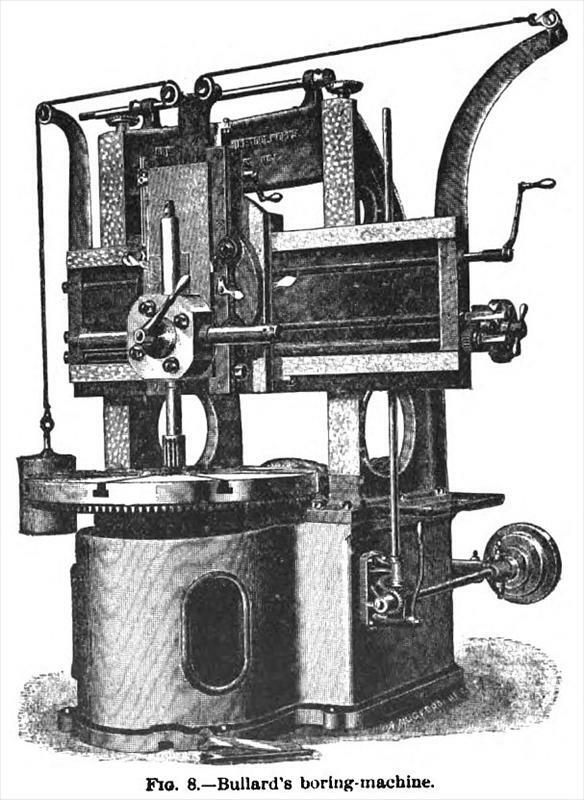 The business was established under the name of the Bridgeport Machine Tool Works in 1879 by Edward P. Bullard, Sr., for the manufacture of engine lathes. The undertaking proved a success from the beginning and was incorporated in 1894 under the present name. The first officers were: E. P. Bullard, Sr., president; E. P. Bullard, Jr., vice president; and A. H. Bullard, secretary and treasurer. There was no change until 1906, when Mr. Bullard, Sr., died, since which time the officers have been: E. P. Bullard, Jr., president; S. H. Bullard, vice president; and A. H. Bullard, secretary and treasurer. The plant is located on Broad and Railway streets. The first modern building was erected in 1892, the next in 1899, another in 1904, a fourth in 1910, and others in 1915 and 1916 until the buildings cover nearly an entire block. The later buildings are of reinforced concrete, five stories in height, and are fireproof. Here the 1,200 workmen are busily engaged in the manufacture of vertical turret lathes in three sizes and the Bullard Mult-Au-Matic, developed by the company, in one size. The product is sold to all sorts of metal working industries all over the world and is put upon the market by engineering salesmen. The devices are patented and the quality of the product is indicated by the continuous growth and development of the business. Men are given life employment by this company, whose policy it is to recognize and stimulate employees to put forth their best effort for the benefit of the business, while recognizing that capability means rapid advancement. This company is now expending huge sums of money in equipping their plant for the manufacture of munitions and ordnance. He and his son Edward P. Bullard II, were responsible for the development of the vertical turret lathe. Bourn & Koch, Inc. is now the OEM for the Bullard machinery You can link to their website at the Bourn & Koch web site. The American Precision Museum website has a biography of E. P. Bullard Jr.
Machine serial numbers from 1919 to 1958 may found at the Bullard Co. serial number page.